I left Dumas, Texas heading into rainshowers and cooler temps. I was actually glad to have my jacket on. Riding the bike has an interesting effect on me. I can be tense, worried about things, and the longer I ride the better I feel. Now, I was kind of feeling guilty for not going back home, but I have no one to go home to at present, so work was the only deciding factor, and it could wait. The clouds were thickening, and the first heavy rainshower soaked my jeans... part of the adventure I remembered! I am now using a HJC flip up full face helmet, it does not fog near as bad as the Shoei helmet I was using. The ride was pretty much uneventful and wet all the way to Clayton, NM where it let up for a bit. The sun would be setting soon, and I really wanted to get to Raton, NM before dark, and the clouds were looking pretty ominous... why am I so hard headed? I should have dug out the rain gear long before! Well, at the first strike of lightening, I dug my jumpsuit out...not sure why, but it made me feel better! And it was soon pouring rain...and I was chilled from having damp jeans on. 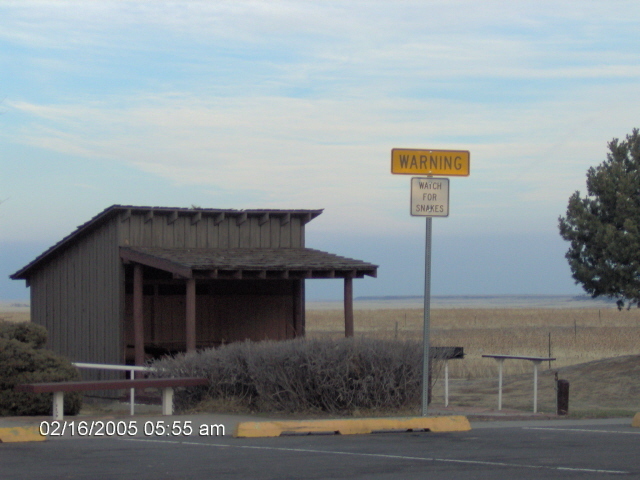 There is a rest stop between Clayton and Raton on hiway 64 (the pic is from an earlier trip). As I pulled in, I saw a couple of other bikers there with bikes under one of the picnic canopies. Sturgis had ended that weekend, and there were lots of wet bikers out in this mess. These guys were from Beaumont, Texas, they were wet and chilled, just taking a break for a few. We chatted and I headed on West.... towards Raton in the rain... and I enjoyed every minute of it. I checked in to the Comfort Inn at Raton...and there were plenty of bikes already there. It was not late, just time to quit for most. That evening, I went to a steakhouse in Raton to have dinner. The Icehouse Restaurant and steakhouse was good, and I will go back. There are a lot of places not to eat in Raton, this is one of the good ones. Sorry guys, but just because you are on the Interstate and have packed hotels at nite...doesnt mean that bad service and lousy food are acceptable, enough said! Back to the hotel for some rest and trying to decide where I would go next.... read more!